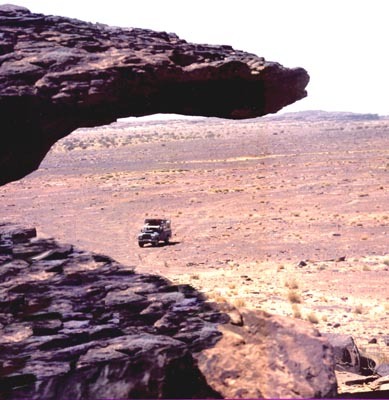 ----- The area is located in one of the most inaccessible parts of a vast wilderness, the Sahara Desert. The area is bounded by shifting sands, rocks, wadis and mountains. ----- Kit Constable Maxwell has experience of several solo desert expeditions to North Africa, Asia and Arabia. 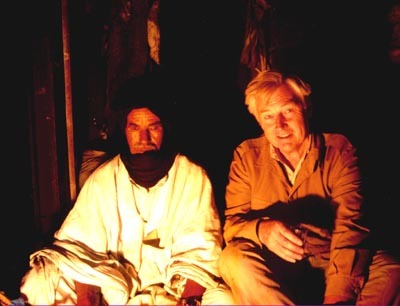 He is preparing for a desert crossing to this area in the Southern part of Libya during October and November 2005. His navigator will be Dr Raymond Bird. 4 ) To photograph and record the expedition for website publication. A Land Rover Discovery 300Tdi, equipped with long range fuel tanks, dehydrated food, water and vehicle spares. Also extra tyres, a self-recovery winch, sand ladders, hi-lift jack and GPS navigation. 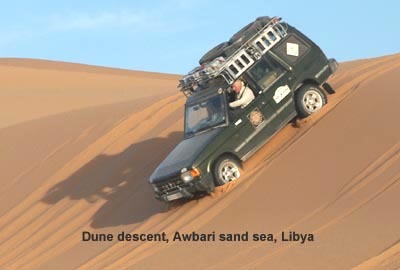 The route will cross the Awbari Sand Sea in the company of a French desert tour group. We will drive over unmapped dunes using GPS Satellite navigation, and a Touareg guide. We expect to make about 75km per day, running on low pressure tyres and using around twice normal fuel consumption.